This MTC Gen II Multistage Clutch significantly reduces clutch lever effort and yet improves clutch adjust ability through its "multistage" technology. 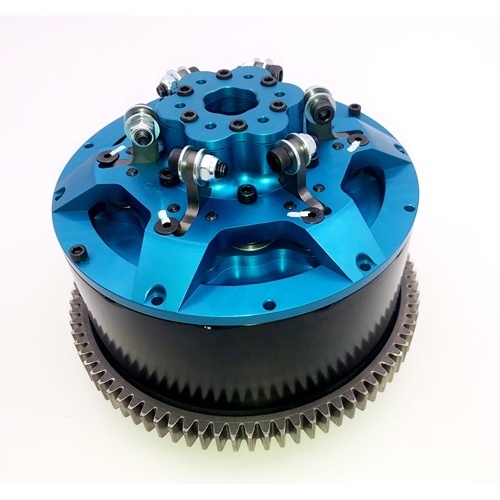 The big improvement in clutch action is related to the drive and driven clutch plates operating at the same rpm for big improvements in initial engagement leading to quicker reaction time and more repeat ability between passes. The new design also allows for easier dynamic spring replacement with its quick access cover plate over the springs. We recommend a Quick access cover as well for between round tuning and servicing. Clutch basket and clutch cover (if not using optional quick access cover) cores required. The Gen II is most definitely a lockup clutch. Both Lockups maintain the use of the clutch lever allowing the rider to ride the bike back from a run and relies on the rider to release the lever for the clutch to engage. Both multistage lockups units employ the same arm and counter spring mechanism and utilize the same shimming procedure to adjust static spring pressure. The Gen II takes a different approach to clutch application. The old standard of clamping the clutch pack between the pressure plate and inner hub is gone. The Gen II utilizes an inner hub with no back lip, so there is no inward pressure on the hub. The clutch is clamped via the pressure plate which is tabbed to the basket and the spacer plate pinned to the bottom of the basket. Engaging the clutch in this manner eliminates an effect generated by the lockup of pulling out on the clutch basket while clamping the clutch pack. The arms are driven by engine RPM instead of input shaft speed, so clutch slippage doesn’t slow down application of the arms resulting in more repeatable runs. Tuning of the counter springs in the Gen II can be accomplished while still installed via a quick access plate on the top of the unit . No longer will you have to remove the lockup from the bike, take the weights from the arms, take out the screws on the dowel pins, knock the arm and bucket out to change the springs. With the Gen II, you will remove the cover plate screws, make your change, bolt the cover plate back on, put the clutch cover on and you are ready to go. Altering the static spring pressure will still require the removal of the lockup unit from the clutch basket, but removal of the lockup is aided by six included bolts. These bolts insure that you will not be fighting the clutch springs to reinstall the lockup unit and tighten the lockup bolts. After the hat is secure, just remove the six bolts on the clutch springs and put them away until their next use. the clutch unlike the slider which fully disengages when the engine RPM drops below the stall speed. It still employs static clutch springs and if you release the clutch lever, with the brake on, it will stall the engine.